Elizabeth Maher Muoio was officially sworn in as State Treasurer on April 17, 2018, after becoming just the second woman confirmed to the post in New Jersey history. She had been serving as Acting State Treasurer since Gov. Murphy assumed office on January 16, 2018. Prior to joining the administration of Gov. Murphy, she had served as a member of the New Jersey General Assembly, representing the 15th Legislative District in Mercer and Hunterdon counties since February of 2015. During her time in the General Assembly, Ms. Muoio served on the Assembly Budget, Judiciary, and Commerce and Economic Development committees where her signature legislative initiatives focused on improving access for women’s healthcare, closing the gender pay equity gap, protecting the environment, reducing exposure to hazardous lead, improving prison re-entry services, increasing literacy rates, fighting against concentrated poverty and expanding economic opportunities for all New Jerseyans. As a result of her legislative efforts, she was honored for her work in the Assembly by the Sierra Club of NJ, the Trenton Chapter of the NAACP, the New Jersey Association of the Deaf, Inc., the Constitutional Officers Association of New Jersey (COANJ), the National Congress of Black Women – Trenton/Mercer Chapter, and the Trenton Public School system for her efforts to help improve literacy. Ms. Muoio also served as Director of the Mercer County Office of Economic Development and Sustainability from 2008 to January 2018. Prior to assuming that position, she served as a member of the Mercer County Board of Chosen Freeholders from 2000-2008, serving as Chair in 2004 and Vice Chair in 2003 and 2008. 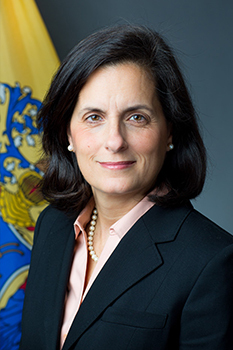 While Chair, she worked with the County Executive to enact one of the first countywide anti-pay-to-play ordinances in the nation and led the effort to ensure that the building of the new $81 million dollar Mercer County Courthouse was constructed to Leadership in Energy and Environmental Design (LEED) standards. She began her career as an elected official serving as a member of the Pennington Borough Council from 1997 to 2002. Throughout the years, she has been involved in a number of community-based organizations, serving as a Troop Leader for the Girl Scouts of Delaware Valley, coaching youth basketball for the Hopewell Valley YMCA and the Hopewell Hoops Basketball League, and serving as a member of the Princeton Regional Chamber of Commerce Board of Directors, the Pennington Public Library Board of Trustees, the ARC of Mercer Board of Trustees, and the League of Women Voters. An attorney, Ms. Muoio received her JD from Georgetown University in Washington, DC, and her BA from Wesleyan University in Middletown, CT. She lives with her family in Pennington, NJ.